The Blue Man Group is coming to Montreal ! From October 4-7, 2013, The Blue Man Group will be performing at the Wilfrid-Pelletier Hall of La Place des Arts. 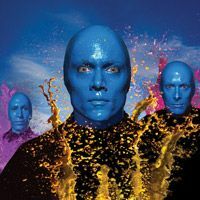 Over the course of those 4 days, The Blue Man Group will give 6 showings. The BMG show will also be visiting Quebec City on October 8 and 9, at Grand Théâtre de Québec. Don't miss this amazing and colourful show in Montreal and Quebec City !